If you are looking to extend your home by moving up into the roof area, then look no further than C J Roofing & Loft Conversions Ltd.
We take care of the entire conversion process. From helping customers with their ideas and developing them with our full design service, to bringing in architects if needed, sorting out the plumbing, electrics and staircases, fulfilling the final project and restoring the roof if necessary. 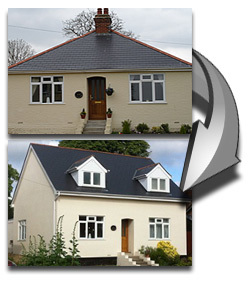 CJ Roofing & Loft Conversions approach each project individually. Everybody’s homes and requirements are different. Not every idea is always viable in the space available and so we give all new clients a free initial visit from our architect to discuss their ideas and from there we work with them to create a conversion plan which is tailored to their own needs, objectives, available space and budget.